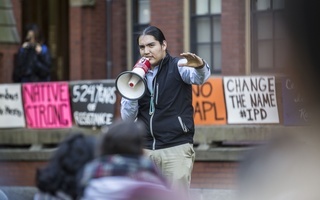 Damon J. Clark '17 speaks at the Indigenous Peoples' Day event in 2016. 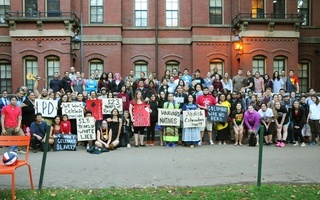 The event's purpose was to celebrate Indigenous cultures as well as to encourage supporters to sign a petition urging the University to acknowledge Indigenous Peoples' Day. Harvard has quietly adjusted its calendar to recognize the second Monday in October as both Columbus Day and Indigenous Peoples’ Day, reflecting a move by the City of Cambridge to rename the holiday last year. Still, some Native American students say they want the University to formally renounce Columbus Day, arguing that the Italian explorer should not be celebrated. Last June, the Cambridge City Council unanimously agreed to change the name of the holiday to Indigenous Peoples’ Day. Nadeem A. Mazen, the Cambridge city councillor who proposed the city’s renaming of the holiday, said the move was intended to reclaim the day for Native Americans killed after Columbus’s landing in the Americas. “At a basic level, we’re saying ‘no’ to a day named after someone who was a tyrant, and was a torturer, and was a destroyer of Indigenous people, to turn this around and to honor those people without saying anything bad about other people,” Mazen said. Ashley N. Hamilton ’20, a member of the Winnebago Tribe of Nebraska and vice president of Native Americans at Harvard College, echoed Mazen. “It’s a celebration of our survival in that we’re still here, thriving, even though it’s not really known,” she said of the renamed holiday. Hamilton said she would like the University to put out an official statement recognizing Indigenous Peoples’ Day. “We were not talked to,” she said. A Harvard spokesperson wrote in an email that the Faculty of Arts and Sciences updated the wording on its calendar to include both holidays in accordance with federal and Cambridge parameters and declined to comment further. 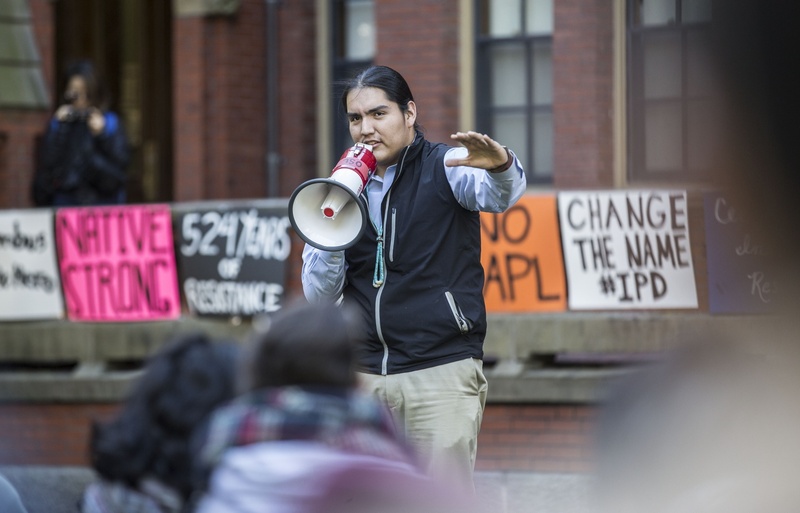 Native Americans at Harvard College has advocated for official recognition of Indigenous Peoples’ Day by the University for years, according to Truman M. Burrage ’19, the club’s president and a member of the Choctaw Nation of Oklahoma. Burrage said the group sent a letter and signed petition to University President Drew G. Faust and a number of other administrators last year, along with a petition. The Undergraduate Council endorsed the petition last year. The group will hold an event in the Yard Monday to celebrate indigenous culture and demonstrate against the name Columbus Day. The Undergraduate Council on Monday overwhelmingly endorsed a motion calling for the University to recognize Indigenous Peoples’ Day instead of Columbus Day.